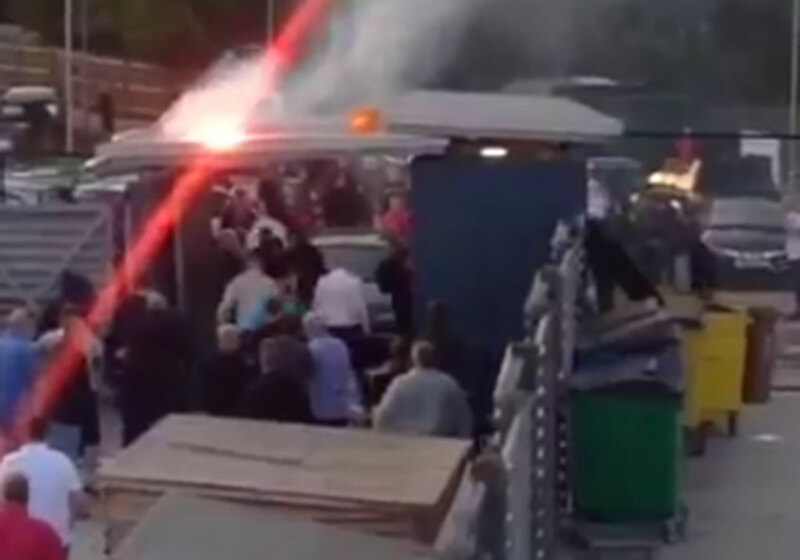 Last night EDL-linked football hooligans attacked the anti-fascist football supporters of Clapton FC as they were entering their final pre-season friendly game against Thamesmead Town. This is the second occasion fascists have attacked the Clapton Ultras as part of a far-right campaign to shut down the anti-racist group of football fans. Last night our club Clapton FC were playing our last pre season friendly away against Thamesmead in South East London. In the last few days, we received threatening messages from a fascist group regarding this fixture. This information was passed on to the football club and its fans who decided to travel as one group to the game as fan safety is the number one priority. As we arrived at the game around 15 minutes after kick off and began to enter, Clapton fans were immediately attacked with weapons and missiles by a large group already present inside the ground, who threw glasses, bottles, bricks, signs and a fire extinguisher at Clapton fans, the vast majority of which had not been able to even enter the ground. In addition to causing minor injury the missiles damaged several parked cars in the car park outside the ground. Thankfully no one was seriously injured. Clapton fans have no history or rivalry with Thamesmead fans and this attack was not made by Thamesmead fans. The attackers sang racist chants (see link below) as they pelted Clapton fans with missiles. This was a planned attack, orchestrated by fascists and their allies as a politically motivated assault on Clapton fans for our politics of anti-sexism, anti-homophobia, anti-racism and anti-fascism. Their interest was never in the football and they only attended the game in order to attack us. We are calling on all supporters of Clapton and all those who stand against fascism to join us this season and celebrate football for all. Specifically, those unable to oppose the fascist White Man March in Liverpool would be welcomed at our home game on Saturday 15th August in the FA Cup against Stanway Rovers. Did the fascists have an aerial laser gunship or something? Are you a complete plonker or something??? Chill out Battlescarred and take a look at the photo accompanying the piece. It's a funny comment.